Ten years after its inception, the State Bar's continuing education for lawyers program is under scrutiny by the legislature, the Supreme Court and the bar itself. California attorneys, most of whom are required to complete 36 hours of education over a three-year period, have become increasingly vociferous about their dissatisfaction and their complaints appear to have gained a foothold. "It seems to be a blip on the radar screen that's getting bigger and bigger," said Andrew Guilford, a vice president of the bar's board of governors who recently proposed a review of the program. "That's not surprising, since it's the area where the bar touches its members most frequently." Although the vast majority of attorneys continue to educate themselves and stay current with developments in the law and their practice area, objections include the number of hours required, cost and availability of programs, the quality of the content, exemptions for some groups, and the bias and substance abuse requirements. "I think the most common objection is that it's simply a cumbersome tool designed to make money for providers," Guilford said, although he believes that is not the case. Lawyers had taken voluntary continuing legal education courses for years when the legislature, seeking to bolster lawyer competence, passed a law in 1989 requiring the bar to draft a mandatory program. The Supreme Court approved the minimum continuing legal education (MCLE) program the following year. The bar has long maintained that continuing education is a professional necessity for active lawyers, asserting that it enhances competence and protects the public. 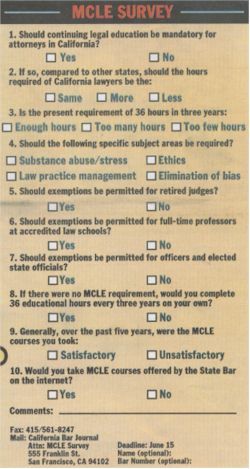 MCLE supporters point often to a 1995 RAND Corp. survey conducted for the so-called Futures Commission which found that 68 percent of those questioned ranked CLE seminars among the top five most important services offered by bar sections and committees. The commission also admonished the bar to try to improve the quality of MCLE courses, noting the "dubious value of some program offerings." Bar president Raymond C. Marshall says he believes the overwhelming majority of California lawyers believe in continuing education and think it's something lawyers should do. At the same time, he acknowledged widespread dissatisfaction with the program. "I would have to say I think MCLE is of great value," Marshall said. "I would also say if we're going to have it, it needs to be fixed." A State Bar-supported dues bill continued to make its way through the Senate, winning approval before the judiciary committee. SB 144, authored by Adam Schiff, D-Burbank, sets bar dues for active lawyers at $395 for the year 2000, modifies MCLE requirements and restricts bar lobbying. It leaves intact several bar programs criticized during the last legislative session, including the Commission on Judicial Nominees Evaluation (JNE), the Interest on Lawyer Trust Accounts program, which funds legal services for the poor, and the Client Security Fund. It also continues the existing system of governance, under which elected attorneys dominate the 23-member board of governors. The conference of delegates and educational sections, focus of anti-lobbying forces last year, remain part of the integrated bar although they would receive no mandatory dues. A seven-year-old lawsuit revisiting the issue of how the State Bar uses its members' mandatory dues went to trial last month, with the bar's political activities once again at center stage.